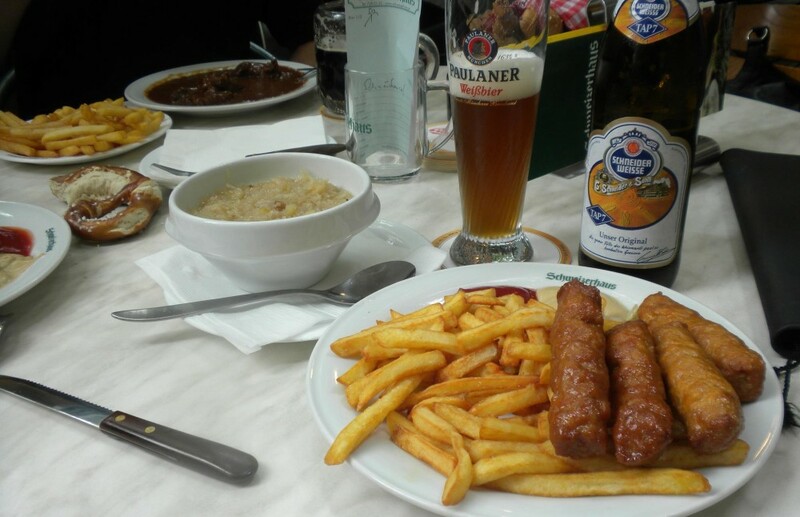 Every night that we were in the Salzburg area, save one, we had dinner at a bier haus. “Another night, another brewery” but in the best possible sense. After driving through the Bavarian “hills” we stopped in Berchtesgaden to have a meal at Bankhammer’s Bräustüberl/Hofbrauhaus Berchtesgaden. We tried several liters of their various brews and enjoyed every last one, lamenting that we wished we had a car with a bigger trunk so we could bring some home. 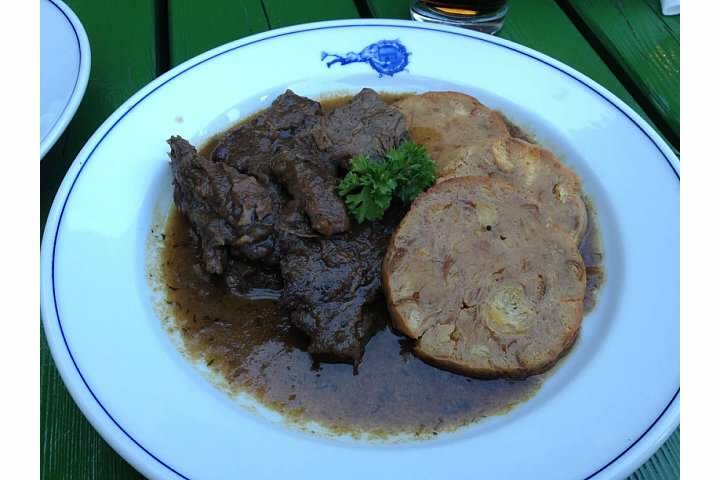 I ordered “bierochse in dunkler Biersosse mit gerösteten Breznknödel” for dinner. Until five minutes ago I would have said this dish is a pot roast cooked in and served with a gravy made with dark beer, accompanied by pretzel dumplings. When I searched for a translation for “bierochse,” however, I discovered that it’s actually an ox stew as opposed to (beef/cow) pot roast. Ooops. Either way, this was a fantastically delicious meal. I think that I can re-create it by using my normal pot roast recipe, substituting part (or all) of the beef stock with dark beer. I am not sure that I will go the extra mile and also substitute the beef with ox meat, though. I have friends coming for a visit in a few weeks and they will be my guinea pigs as I test this theory. Stay tuned. Stiegl is a popular beer in Austria, and it is brewed in Salzburg. You can take a tour of the brewery, buy a variety of Stiegl beers and beer merchandise, and have a meal at Stiegl Brauwelt. We only had enough time to enjoy a meal there, but even that was informative because we ate in the machine room that housed some brewing equipment. Needless to say, our dinner was accompanied by delicious, fresh Stiegl beer straight from the teat (so to speak). 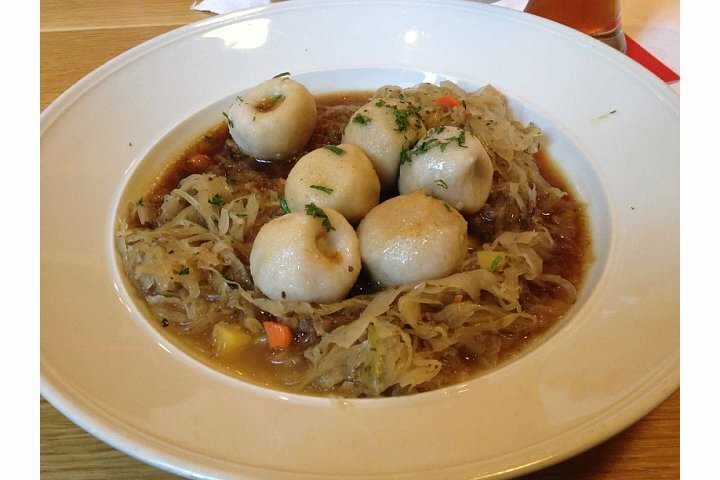 I had the Innviertler Knödel, which were dumplings filled with minced meat and served with a wheat beer sauce and warm sauerkraut. The dumplings were good, but I am not sure that I’m willing to take the time to make the knödel in an effort to recreate this dish. Dessert knödel are a whole different story because everyone in my family enjoys them, and I plan to try those at some point this summer. I also plan to try my hand at sauerkraut in the very near future. Everyone in my family loved Salzburg and we hope to return to the area before we leave Austria. 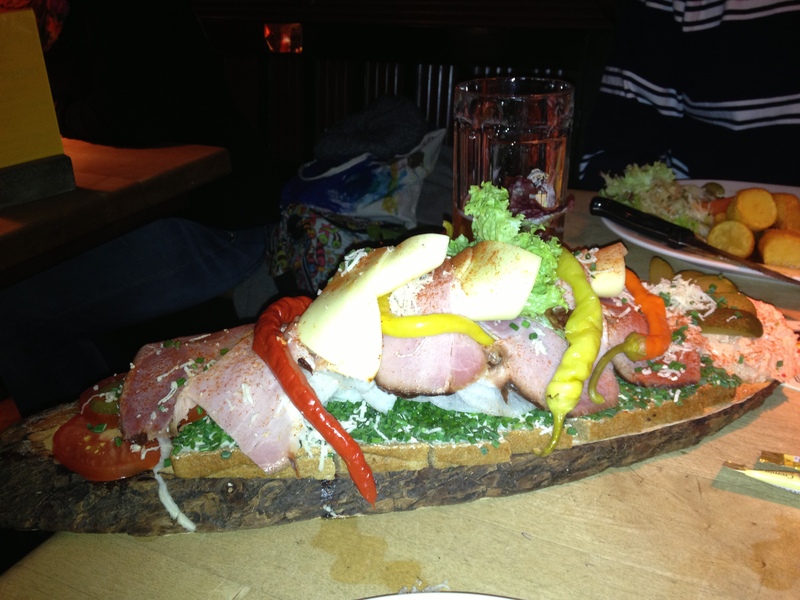 We want to return to Stiegl Brauwelt to see all that it has to offer, and to enjoy another meal in its restaurant. Hopefully there will be a follow up to this post. Many restaurants in the city offer lunch-time “menus,” which is what we would call a set meal. You can choose to have either two or three courses (i.e., whether you want a soup or dessert, or both), and often times you have a choice between two mains. The menus are generally inexpensive, or as close to it as you can get in Vienna, so I choose them whenever they’re offered. Today’s lunch began with a bowl of mushroom cream soup. I’ve yet to have a bowl of bad mushroom soup here, and this soup did not prove to be an exception. I am definitely going to find a recipe for this soup. In case you are wondering, no, not every Austrian soup is vegetable- and cream-based; those are just the ones that I enjoy the most. 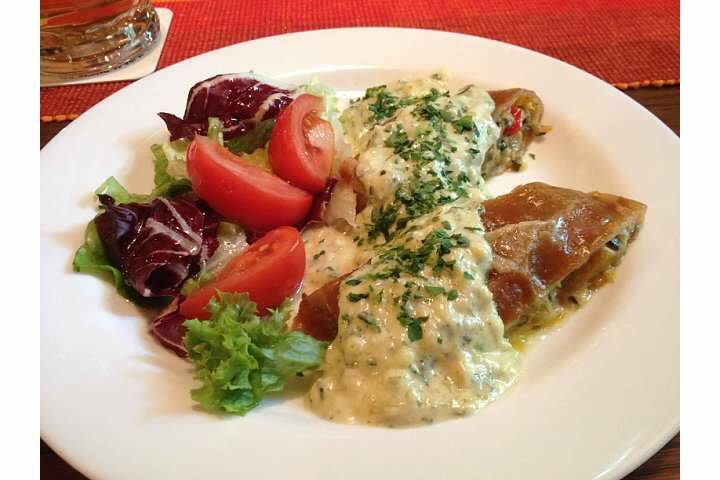 I chose the pepper and zucchini strudel as my main, and I am so glad that I did. I generally enjoy savory vegetable strudels (spinach and cheese is a big one here), but this one had the bonus of being topped with a cheese sauce. I’ve been wanting to learn how to make strudels for a long time since my husband is ga-ga over apple strudel, and my desire to re-create this meal might finally give me the impetus that I need to finally start trying. The meal ended with a palatschinken (crepe) filled with apricot marmalade and topped with a dusting of confectioner’s sugar. After my fantastic lunch at Häuserl am Roan I’d decided that I need to learn how to make crepes, and this simple yet fantastic dessert has confirmed this as a “must do.” So, in short, I need to get cracking on my strudel- and crepe-making. This should be a fun challenge. 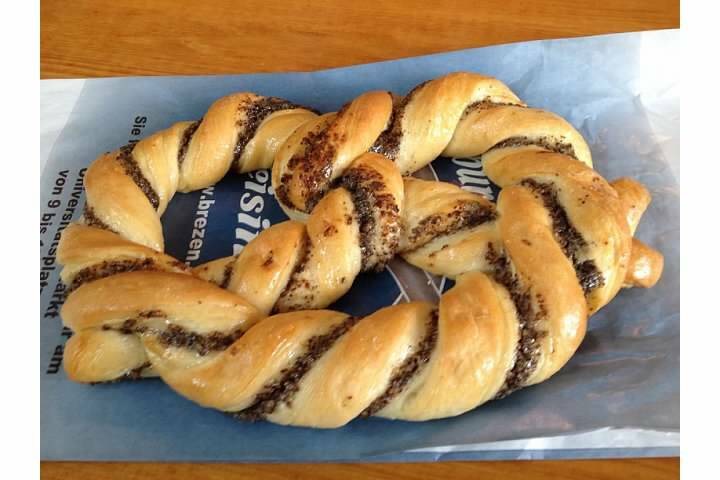 Surely there was a measure of irony intended when this was listed on Fischerbräu’s “Kleinigkeiten” (little things) menu as a “jause” (snack)?